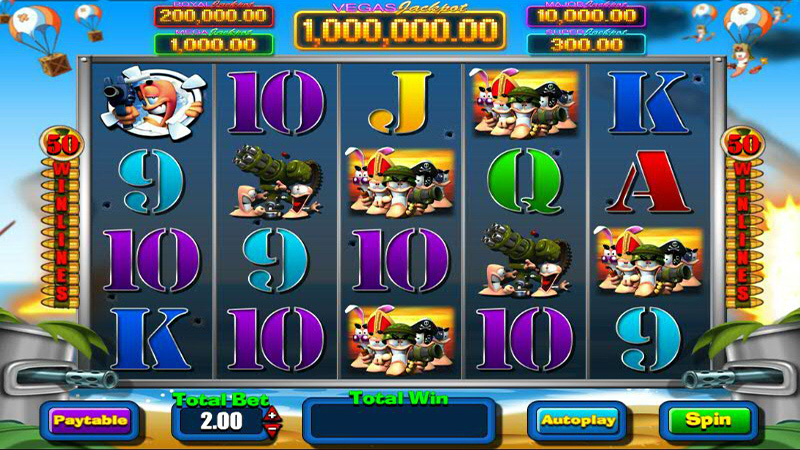 Adapted from the brilliant video game, the Worms slot machine uses the same enjoyable graphics and sounds effects to bring to life the entertaining little world of the Worms. Using 20 winlines, the Worms slot machine awards up to £500 per game, with multiple stake options and a gambling bonus in the same style as Genie Jackpots. The gameplay of the Worms slot machine is very much in keeping with the aforementioned Genie Jackpots, with randomly awarded features as well as bonus features awarded from landing three crates on the centre three reels. Playing at £2 per spin awards a re-spin with any two bonus symbols, with an enhanced reel so the chances of achieving a feature are dramatically improved. You will then be offered the chance to pick a crate with one of three features been awarded. The features are all ok, but the players favourite is usually the Space Trail whereby a little worm works his way across a series of asteroids with ever increasing values of money up to £40. At the end of the trail, beyond the £40 win is a higher value screen with wins up to £500 available. As well as the crate bonus features, there is also a chance to be awarded one of several random features via an exploding bomb at the top of the screen. The random features can be very generous, but also pretty poor. Large series of wilds can create massive wins, as can the Golden Donkey, although you may also end up with a low value award. The Worms slot machine is a great fun £500 jackpot game, and although it is getting old, Worms can still command a loyal player following. 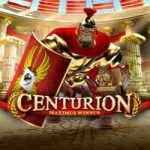 It’s unfortunate that an online version hasn’t been released, but I suppose the Centurion slot machine is an enhanced version of Worms and will also appeal to a wider target audience. Playing the Worms slot machine on £2 stake results in two bonus symbols been held for a bonus respin on enhanced reels. This results in a very high increase in the number of features awarded during game play, with a very high chance of been awarded a feature when two symbols have been held over. 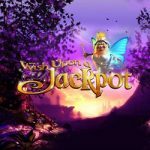 In much the same way as Wish Upon a Jackpot works, the £2 stake is very rewarding so give it a try if your funds allow for it. Gamble up to x10 in bookies and arcades, or play for big bucks and big stakes online. £2 stake awards bonus respin.